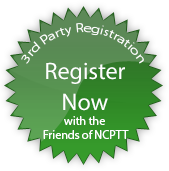 Friends of NCPTT – Cultivating the future of preservation. 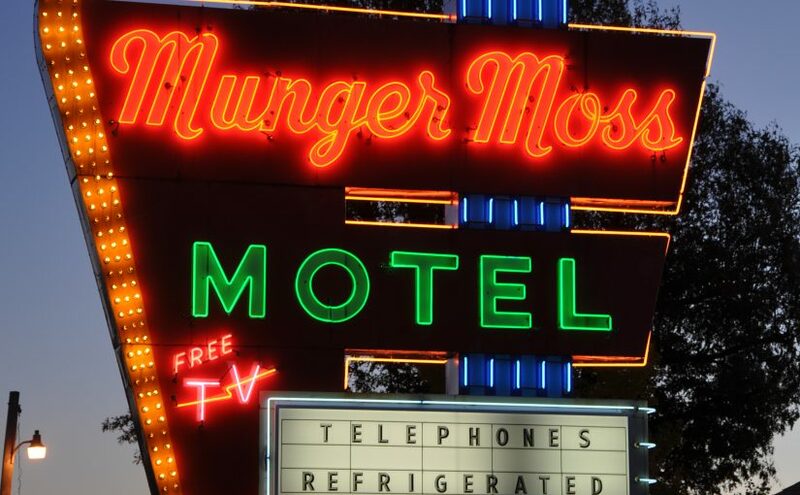 Preservationists work diligently to preserve neon signs like Munger Moss Motel. It is not every day you hear about someone maintaining a dinosaur, but that’s exactly what Jennifer Carpenter does as part of her job as a Preservation Specialist with Texas State Parks’ Historic Sites and Structures Program. Carpenter preserves two life-size ancient reptiles from Sinclair Oil’s Dinoland, an attraction at the 1964 World’s Fair, that now reside at Dinosaur Valley State Park. She will join an impressive list of twenty-four speakers at the “Are We There Yet? Preservation of Roadside Architecture and Attractions” symposium, to be held April 10-12, 2018 in Tulsa Oklahoma. 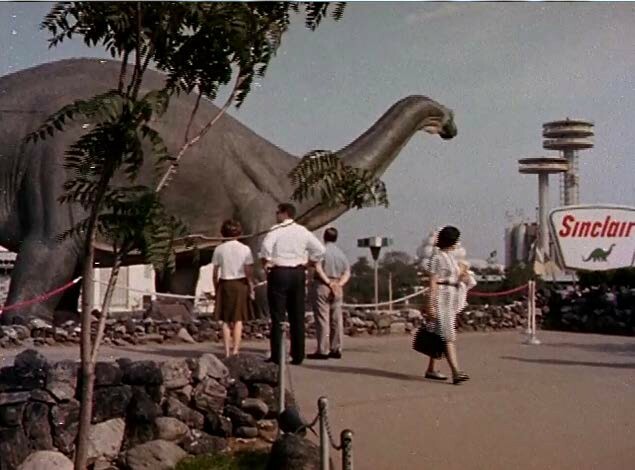 The three-day symposium will focus on the preservation of roadside architecture and attractions that catered to tourists traveling American roads during the 1920s-1970s. The symposium will bring together architects, engineers, landscape architects, site managers, conservators, facility managers, and other cultural resource professionals to discuss issues related to the preservation of roadside features, including oversized structures and sculptures, motels, gas stations, neon signs, and other unusual features. Michael Wallis, best-selling author of “Route 66: The Mother Road” and the voice of Sherriff in Pixar Cars movies, is the keynote speaker. He will present on Route 66 structures and sites. Dylan Thuras, co-founder of Atlas Obscura and co-author of the New York Times Bestseller, “Atlas Obscura: An Explorer’s Guide to the World’s Hidden Wonders” will open the second day of the symposium and discuss how storytelling, communications, and media can be used to garner funding for preservation. 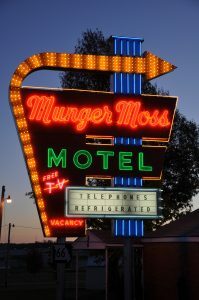 The agenda includes an evening neon sign tour, and a guided field session to local roadside attractions including the Meadow Gold sign in Tulsa, the Blue Whale of Catoosa, and Ed Galloway’s Totem Pole Park, Foyil, Oklahoma. The symposium is organized by U.S. National Park Service’s National Center for Preservation Technology and Training (NCPTT), the Friends of NCPTT, the NPS Route 66 Corridor Program, City of Tulsa, and the Tulsa Foundation for Architecture. 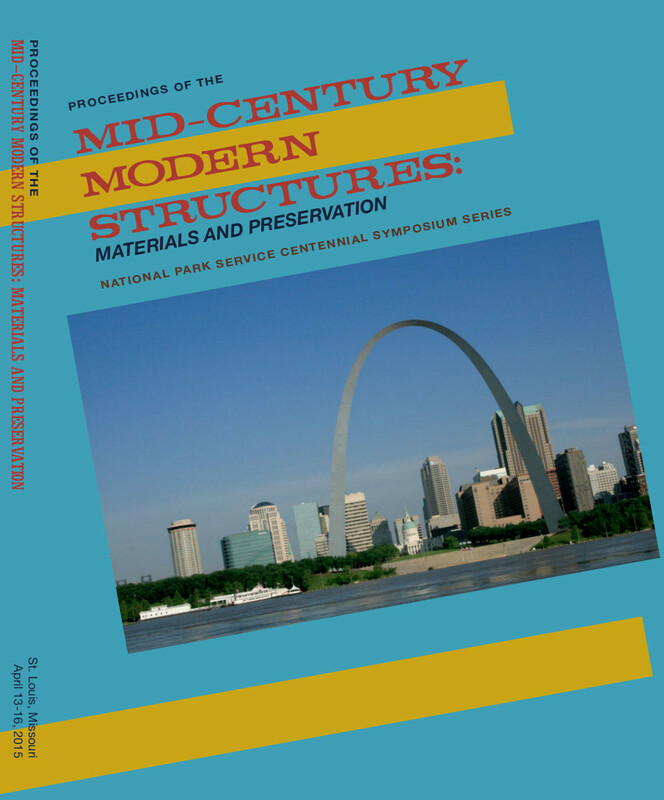 Proceedings of the Mid-Century Modern Structures: Materials and Preservation is available for purchase as a printed book via PayPal or as a digital book via the Amazon Kindle Store, courtesy of the Friends of NCPTT. 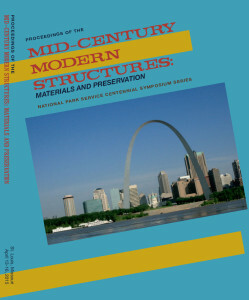 The Proceedings contain 24 papers presented as part of the Mid-Century Modern Structures: Materials and Preservation Symposium, held April 14-16, 2015, in St. Louis, Missouri. The symposium focused on the history, use, and preservation of materials found in Mid-Century modern architecture. The symposium proceedings will provide an in-depth understanding of the complex issues associated with the preservation of these structures. A special section features papers associated with the study and preservation of the Gateway Arch. 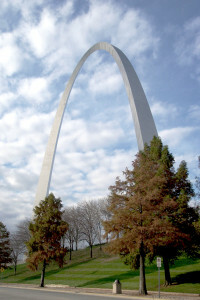 The publication was sponsored by Friends of NCPTT, the World Monument Fund, the American Institute for Architects St. Louis, Washington University in St. Louis, and the Jefferson National Expansion Memorial. Join the experience in Santa Fe, New Mexico from June 21 to 23, 2016. 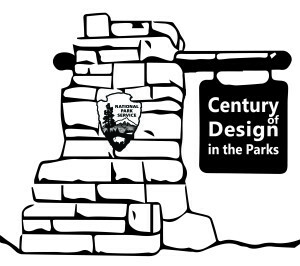 Learn from our nation’s leading experts about how to preserve the built environment within national and state parks. Understand the role that materials played in the development of these unique sites. 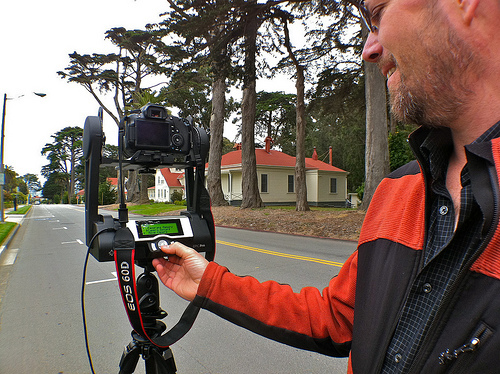 Study sites from early rustic, CCC, WPA, post-WWII era, NPS Mission 66 campaign, and beyond. interpretation of NPS designed features, among others. Plan to be part of this symposium today! Submit an abstract as part of the call for papers and posters by January 15, 2016. Student Registration $99 (limited number, register early). To register, submit a presentation, or for more information, see NCPTT’s website at www.ncptt.nps.gov. It’s time to register for the Mid-Century Modern Structures Symposium! 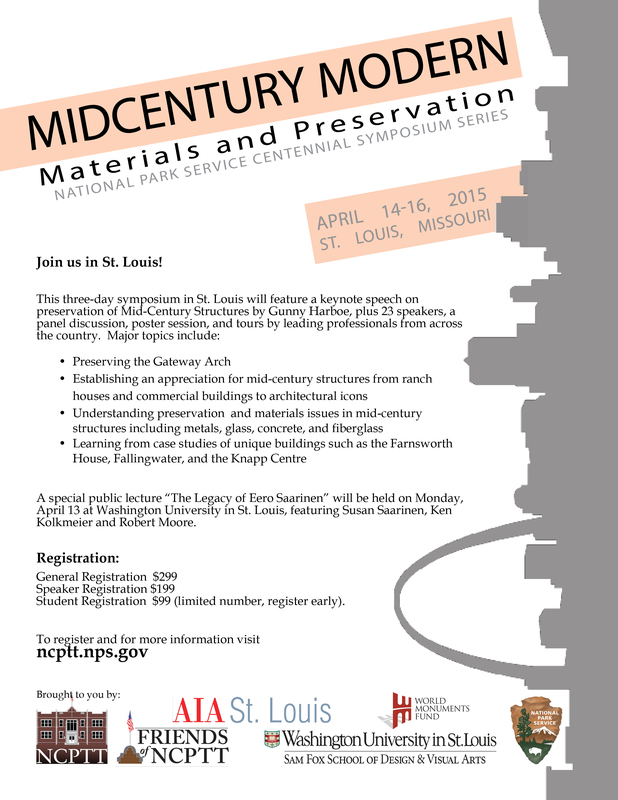 This three-day symposium in St. Louis will feature keynote speaker, Gunny Harboe, on preservation of Mid-Century Structures, plus 23 speakers, a panel discussion, a poster session, and tours by leading professionals from across the country. The Program schedule can be found here. Join us for a special free public lecture, The Legacy of Eero Saarinen, on Monday evening, April 13, 2015 at Washington University featuring Susan Saarinen, Ken Kolkmeier, and Robert Moore. Lodging at the Drury Plaza hotel is going quickly. Make arrangements now!!! Reservations may be made by calling Drury Plaza Hotel at 1 -800-325-0720 and refer to the Group number of 2216756. A block of room will only be held until March 13, 2015. 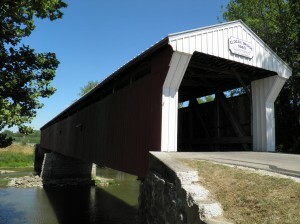 Held in historic downtown Dayton, participants will also experience a timber framing demonstration, attend a reception and dinner at local historic sites and tour several historic covered bridges. The conference will offer the opportunity for exchange between a diverse audience of civil engineers, public transportation officials, academics, trades people, historians, architects, and covered bridge enthusiasts. Mark your calendar and plan to attend! 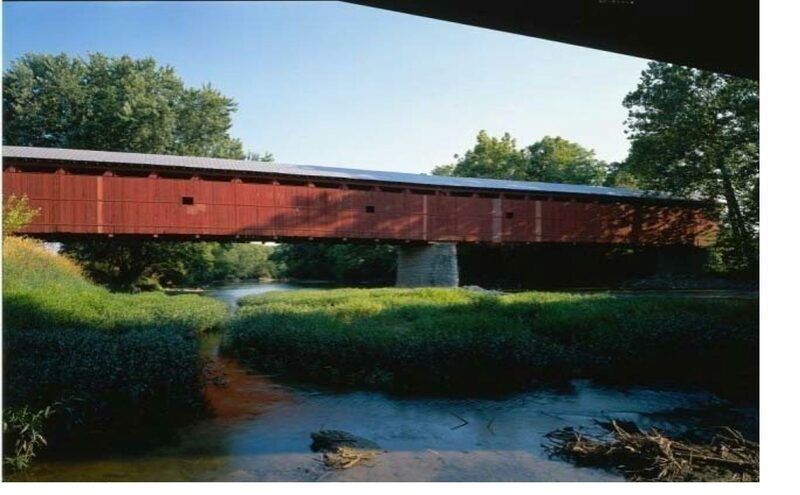 Attendees from across the country and overseas will be gathering in Dayton, Ohio to share and learn about rehabilitation of historic covered bridges. 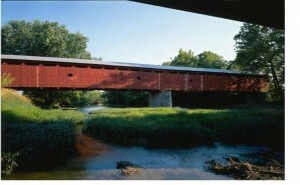 The conference planning committee welcomes your participation at the covered bridge conference. In addition to our national and local partners (Federal Highway Administration, National Park Service, USDA Forest Products Laboratory, Ohio Historical Society, Preble County Historical Society) we are offering a number of sponsorship opportunities. In kind services are also appreciated. Please contact Steve Simmons, conference sponsorship coordinator, for more information. 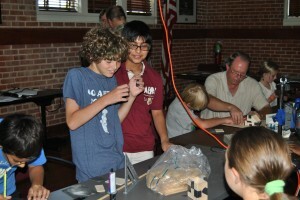 Students study an authentic pottery shard as part of "Conservation Scientist for a Day" workshop. The Friends of NCPTT are pleased to sponsor the “Conservation Scientist for a Day” workshop on July 31, 2012 from 9:00 AM to 5:00 PM. Students have the opportunity to learn more about the history of Natchitoches through the study of authentic pottery shards. High school students work in pairs to investigate a piece of pottery from Native American or French colonial archeological sources. The students document their pottery through hand drawings and photographs. Then, they explore the physical can chemical makeup of the object using microscopy, chemical spot tests, and X-ray Fluorescence analysis. 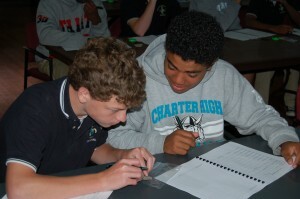 The workshop is open to all students that have completed the 8th grade and higher. The cost of the workshop is $10 per student. Scholarships are available. According to a July 2011 report by the Statistical Research Center at the American Institute of Physics, students in the state of Louisiana rank far below average on performance tests in math and science. Since the National Center for Preservation Technology and Training (NCPTT) is a science and technology research organization, they have a potential role to play in the education of students in the region. 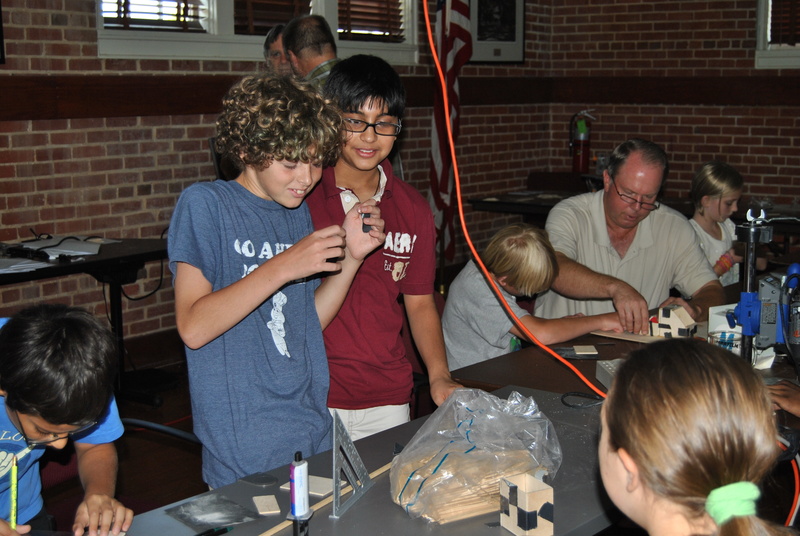 Each year, NCPTT reaches out to schools around the state to offer educational activities that cross the disciplines. Rather than being a school sponsored event, this year’s summer workshop marks the first time the event is open to registration for all students in the region.